A clogged juicing screen is the most common reason for poor juicer performance. 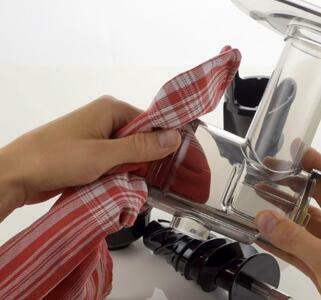 Keeping it clean will allow your juicer to perform like new, and minimize and backup or motor strain. These tips will ensure a long and productive life for your juicer. The best way to see if your juicing screen is clean is to look through it at a strong light source. Your screen might look clean when mounted on the juicer, but you may be surprised to see many clogged holes when held up to a light, even if you have been cleaning it regularly. This is especially common in juicers with a fine screen for hard fruits and root vegetables, as those holes are very small. The most common reason for a clogged juicing screen is not cleaning it immediately after juicing. If you leave it for later, tiny pulp bits and juice residue will dry, sealing the fine juicing holes. These are much easier to clean before they have dried. If you can't clean it immediately, at least put the juicing parts into a bowl of water until you can clean them. Most municipal water has at least some mineral content, either due to natural causes or added for taste. 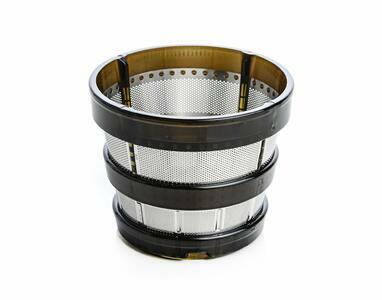 If you let your juicing screen air dry, mineral deposits can form in the sieve holes of a fine screen. To avoid this, make sure to physically dry your juice screen with a towel. If you live in an area with high mineral content water, make sure to wipe down the feeding tube and juicing chamber as well to prevent mineral deposit discoloration. A clogged juicing screen can usually be cleaned by soaking it for at least a few hours in a solution of water mixed with vinegar or citric acid. 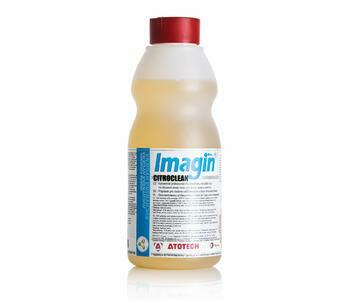 You can also purchase a commercial cleaner such as Citroclean and mix it in a 1:3 ratio with water. After soaking, scrub it with a cleaning brush or toothbrush and rinse it. It should look good as new. Which juicer is the easiest to clean? If fast cleaning is an important factor when you choose a juicer, then single auger juicers should be considered first. Because they have relatively small juicing screens compared to centrifugal or vertical juicers, the screen cleans up very quickly. 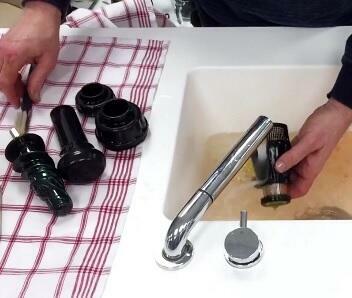 In our test of the Vidia horizontal juicer, we found it cleaned in about a minute. The Sana 606 and Sana 707 horizontal juicers also are among the easiest juicers to clean.